In the above picture the size of the moon varies: it becomes smaller when the mouse hovers over the image (or you tap it). Which size is the correct one, given the perspective of the scene? Answer: the smaller one, nearly unbelievable. The “moon illusion” consists of two phenomena: (1) the moon appears larger than it actually is, and (2) this enlargement is much stronger on the horizon than at the zenith. Generally, any celestial objects near the horizon looks larger than when the same object is high on the sky. The moon in the above picture is of “aesthetically correct” size. 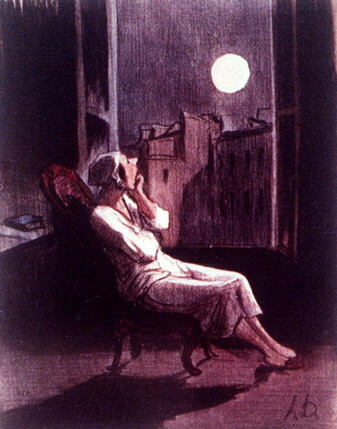 By placing the mouse over the picture (or tapping it) the actual size is seen (pictures from Rock 1984, based on the painting by Honoré Daumier »O Lune! … Inspire-moi ce soir quelque petite pensée…« 1844). The moon illusion is usually explained through size constancy, with the necessary additional assumption that the ‘default’; distance for any object is less than the horizon/skyline distance. Amazingly, when you bend over and look through your legs, the moon illusion is greatly diminished (Coren 1992, Higashiyama & Adachi 2006)! This underscores the influence of context on size constancy.